A quick analysis of the Binary Robo X program shows that it is a scam made to lose your cash. According to its presentation, Binary Robo X is the best trading robot in the world. It allegedly can make you $2,000 every day. And the robot is free, so can you make tens of thousands of dollars per month for free? When you look at the Binary Robo X website, you will quickly notice that it uses the BinBotPro video. The suspicion that Binary Robo X has no own product is confirmed when you sign up, it gives you access to the BinBotPro robot software. And we already reviewed BinBotPro in the past and we explained that it is a scam. The trading software, which by the way is also used by the Centobot scam, has a very dirty function. The demo that is built in the platform is fake, it doesn’t simulate real trading. So it generates a lot profits, but they have nothing to do with real trading. Real trading results would be different. Nevertheless people with little or no experience in trading will not see through this trick, so they will think that Binary Robo X is really profitable. Then they will let the robot trade with their money and they will quickly loose it, because real trading results cannot be faked. This is how this scam works. Recovering money is in these cases very difficult. The true purpose of Binary Robo X is to make you deposit with an unlicensed broker that the scammers are affiliated with. Because they will earn a commission if you do it. That’s all they’re after. So they can afford to give you a losing software, because they will make money anyway, no matter your results. Binary Robo X is a typical scam that abuses binary options. It is a losing software, so stay away from it! There is no magic, if you want to make money in trading, you have to learn, test and build yourself a profitable strategy. Try that on a free demo account with a regulated broker, if you are interested. Don’t trade with real money until your strategy is proven to work on the testing account. 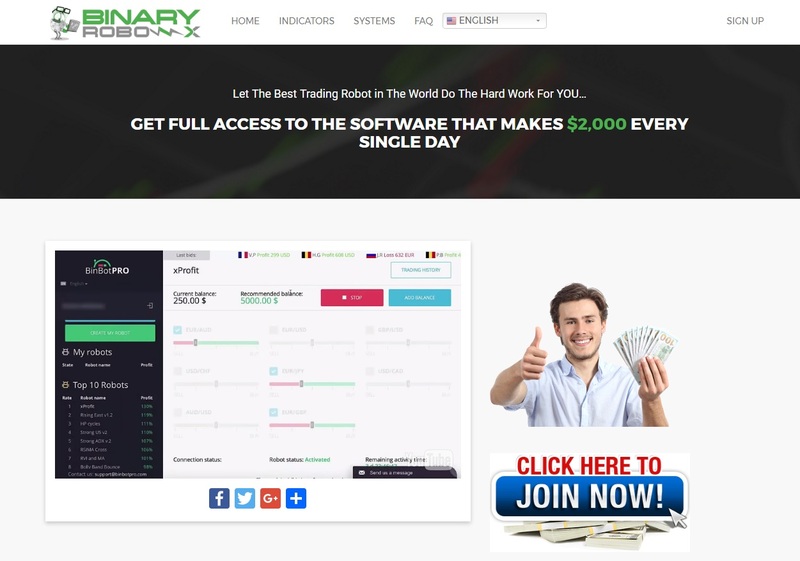 You are completely wrong, binaryrobo x is a legit automated robot for binary options. It is the only certified. Legit? Certified by whom? Please don’t lie, it’s a scam.